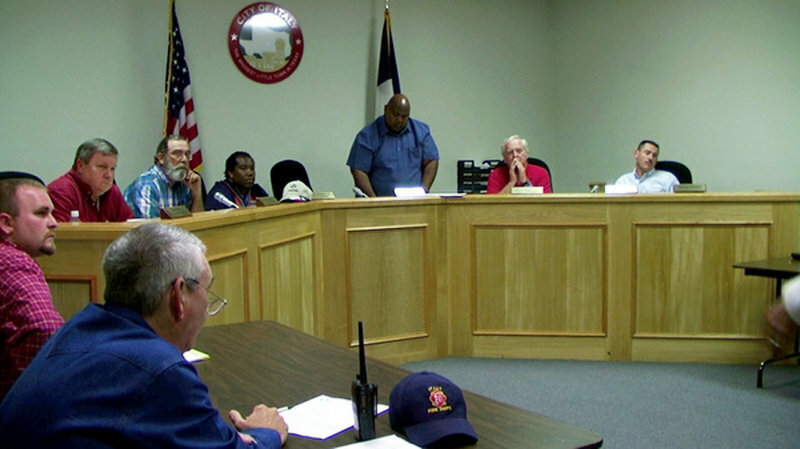 Town Council — The Italy City Council: John Droll (who voted against the salary), Mark Souder, Dennis Perkins, Mayor Frank Jackson (standing), Greg Richards and Rodney Guthrie. On Monday, the Italy City Council turned the Mayor’s job into a paid position. This is not just unwise, it’s probably illegal and certainly unethical. It undermines the trust of the community and makes everyone feel that the good old boy system is alive and well in Italy, Texas. According to Texas law, the mayor’s pay must be set before January 1 prior to the next election. I’ve heard that there is supposed to be some kind of loophole “interpreted” by the Texas attorney general. Big deal. If you feel that you must use a loophole to get around a law, that should be a warning flag that you are doing something wrong. The spirit of the law is to tell the citizens of Italy that the council thinks the mayor should be a paid job where it was once voluntary. The citizens deserve to know this before elections. If the public knew that the mayor was going to be paid, don’t you think there would have been more candidates? Sure you did. Hence it was kept totally quiet until it was too late for others to join the race. Are we to believe it was an accident that the vote to PAY the mayor was done the same day as the vote to not have an election? This even eliminated the possibility of a write-in candidate. Why was this not put on a public referendum? Why didn’t the citizens of Italy have a say on this matter? Were you afraid they would say no? What amazes me is how this was pushed through when we are in a recession. Times are tough. People are losing their jobs. Everyone is tightening their belts. And now we decide to start paying the mayor? And in the same meeting, we are told there is no money to fix a leak on Highway 77. Seriously? Ignoring the citizens, bypassing the spirit of the law, failing to live up to your obligations. It’s not just bad behavior, it’s wrong. I think the citizens of Italy should file for a recall of the entire council — save one, John Droll. Councilman Droll voted against it. Good going John. As for the rest, shame on you. I am as horrified by this action as you are and I completely agree with you about recalling the entire council with the exception of the only one with any moral character – John Droll. Please let me know what we as citizens of the city of Italy, need to do to push this through. If we need to go to Austin to file this proposal, I’ll drive!!!! a detailed explanation is in order for this decision. First of all is it illegal or not? Before blasting the City Council you must have your facts correct, and now we all know just how great Mr. Droll is because he voted no. If you get rid of the ones who voted yes just get rid of them all. Mayor Jackson has served the City of Italy with Pride and Dignity. He has served Italy for quite sometime without a pay check. Who else would serve Italy and not get paid? I don’t know how long he has been Mayor of Italy, but I do know it has been quite sometime. He deserves a check, and yes maybe if the public knew about the pay someone else would of run against Mr. Jackson. If that had of been the case, would another person have ran to serve Italy, or would it have been just for the check? I will say Good Job Mayor and I hope you serve for many more years. Theres no point of haveing a Mayor or City Council that does nothing to help the city. Maybe thats why there are so many houses in Italy for sale and businesses closing down. Why live in a town that has nothing to offer for its childern or citizens? The downtown area looks like hell. The buildings are run down, streets are crappy, and theres no sign of hope for this town. Why worry about building a new park in Italy, to hell with a park. This town may attract some new residents and businesses if the town was cleaned up, streets repaired, and the downtown area restored to what it originally looked like. And for a paid Mayor position, I didn’t know you could get paid for watching tv. Wow here comes the race card again. Why is it that everything must be about race? As I recall I never saw anything in any of these comments about anything concerning that he’s black. My suggestion to you is to get your race off your back. Mr. South shouldn’t have to discount domes because of the economy, thats why there’s Section 8 Housing. I wish I had a race card I could play, but I don’t. I don’t understand why people get so pissed off when the facts are presented. Mr.South is a well educated and smart person and he does his research. 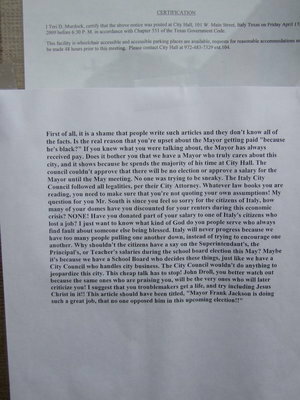 Letter posted outside city hall — This letter was taped to the glass outside City Hall where official notices are posted.